Power dissipation (Convection cooling/ forced air-cooling)? Do we need computer monitoring of voltages and currents? Include an USB-HUB (use one of the ports for the power supply communication)? Configuration (to use or not to use the SDR-1000)? People who use it in combination with the SDR-1000 need less power from the power-supply and are using a custom built supply or the SDR-1000 power supply. Will the 13.8Volt really be 13.8Volt or “something” between 11.0 Volt and 15 Volt? In other words: How many people are going to use the HPSDR mobile? Transformers: From my opinion there will always be a normal mains-transformer, both in the switching and the linear power supply option. Building a switcher for 110Vac/230Vac is too dangerous and complicated (safety regulations) for (less experienced) home-builders. The switcher will be situated in the low-voltage part. Based on the Teamspeak Session from 31st of May 2008 the idea arose to develop a simpler power supply. The working title for this supply became Tiny Demeter. Current rating can be increased by adding multiple regulating power transistors. Temperature regulator/monitor; Due to the nature of linear regulators the power dissipation will be around 15 Watts (without extra regulating transistors). Input protection circuit; probably consists of a fuse and a diode OR a fuse and an electronic switch (switch only closes when the input voltage has the right polarity). Please note: THIS IS NOT THE DESIGN FOR DEMETER, ONLY AN EXAMPLE OF THE TOPOLOGY. The following documents contain a part of the design of Tiny Demeter. "Tiny Demeter design.pdf" contains (some) engineering notes. The file "Schematic Prints.pdf" contains the schematic of the switcher, however without the correct values for the components. 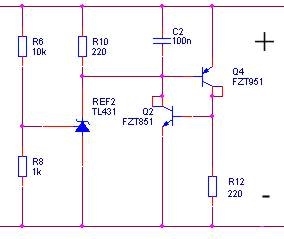 You can use it to get a general idea of the DC/DC converter design. More details of the design will be added soon!